Go on Thursday nights for Gaz's Rockin' Blues. About: St Moritz Club is housed in a deceptively spacious cellar. It has played host to various changes in the music culture over the years and is continually reinventing itself. Home to Gaz’s Rockin’ Blues – London’s longest running weekly club night – the St. Moritz is almost royalty. It appeals to the students – particularly on Thursday nights – but its music policy makes it one of central London’s most consistent venues. 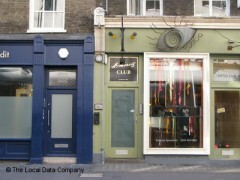 The Soho subterranean club has been popular with London’s students for years. Catch Gaz’s Rockin’ Blues on Thursday nights to mix with the city’s art students and all those who like their music with a little soul. "a typical Soho club with a bargain five pound door charge"
This is an empty storefront by day that opens up the doors to the basement below when the night hits and its purpose becomes clear. It’s a typical Soho club, shut off below ground level where its noise is restricted, but it happens to host London’s longest running one-nighter. Gaz’s Rockin’ Blues has been going since the early eighties when Gaz Mayall started playing out his musical education that he’d collected from a life as the son of a musician. It’s a squeeze in the club, but the décor’s a mixture of neon, whitewash and that homely, varnished wood of the traditional bar and while it gets pretty sweaty it never feels too close. A dance floor fills its own room where at its head is a cave like stage and it doesn’t take much to get it going in here thanks to the low ceilings but the music could take itself to a much bigger venue. At times it feels like the Thursday night set of rockabilly, reggae, R&B and ska can feel under-appreciated by the young crowd and you quickly get the sense that the night has its band of regulars. Saturdays host a bigger mix of genres but the focus is on rock ‘n’ roll and it tends to attract a more varied bunch who see the bargain five pound door charge and whoop their way in. St. Moritz doesn’t seem like much but there’s a little legend about it- keep it in mind for those nights where you’re wandering aimlessly and no one can decide where to go, then it’s your doozy. Kinda pokey but with a good atmosphere. The drinks are a little bit pricey but pretty good for club prices. Small bar though and only two toilet's so you'll spend most of your time queueing. They used to have a fantastic rock/metal night on Saturdays, I don't know if this is still the case 'cause last time I went there the place was full of baseball capped shirt wearing types 'bigging it up' to the latest vines/strokes/white stripes tracks.